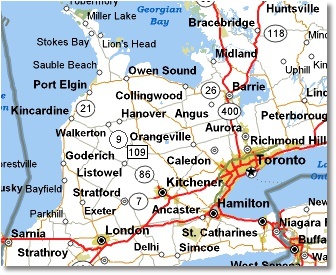 We are located 3 km S of Kincardine on Hwy 21. 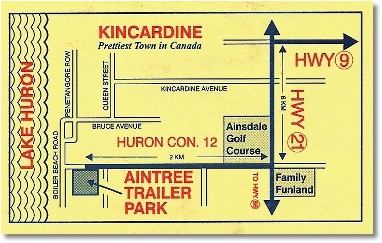 At the corner of Hwy 21 and Huron Concession 12 are the 18 hole Ainsdale Golf Course and Family Funland Minigolf and Go-Carts. 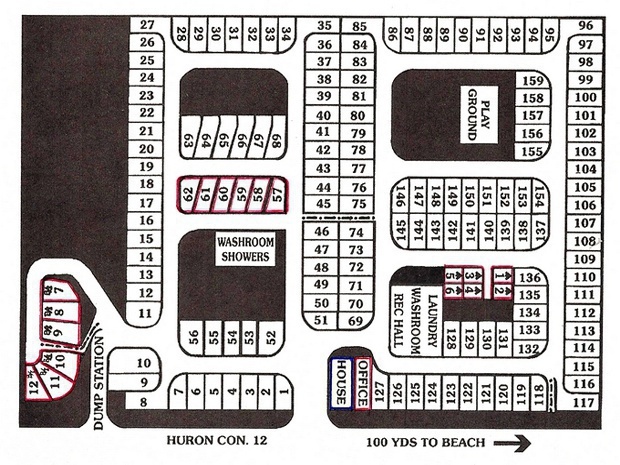 Turn and travel West 2 km towards Lake Huron on Huron Concession 12 Rd to Aintree Park, entrance on left. Please Register at the Office on Arrival! OUR 18 OVERNIGHT CAMPING SITES! *^1 -*^6 by Recreation Hall. *57 -*62 by Washroom/Shower Bldg. How's the weather in Kincardine? Please be aware of possible GPS misdirection when using our name for location. GPS database providers are currently working on revisions to correct our location information.